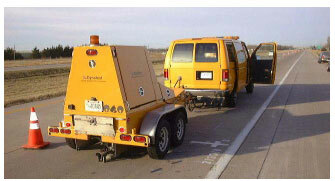 The Falling Weight Deflectometer (FWD) calibration system was developed in the early 1990s under the Strategic Highway Research Program (SHRP) specifically for the Long-Term Pavement Performance (LTPP) program. This was necessary because, at that time, a calibration protocol for FWDs did not exist, and LTPP data quality standards required that there be some method of assurance that deflection data would be accurate and consistent between different FWDs. Four LTPP FWD Calibration Centers, operated by the State transportation departments, have been in existence for more than 15 years. The original centers were located in Pennsylvania, Texas, Nevada, and Minnesota. Figure 1. LTPP FWD in Operation. These calibration centers have been widely used by both public and private agencies for FWD calibration, providing a service that gives FWD owners and operators the best possible assurance of data quality. LTPP has supported these calibration centers by providing technical assistance, equipment replacement, quality assurance (QA) reviews, certification, and travel for the FWD Calibration Center Operators to meet each year to exchange information, learn about planned updates, and provide feedback on their experiences in operating the calibration centers. 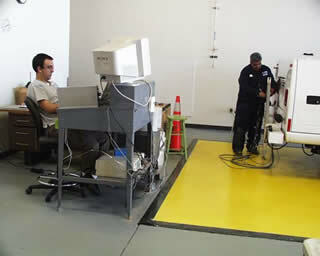 By 2001, due to changes in technology, the 1994 calibration system was in need of an update beyond the resources of LTPP. To address this need, the Federal Highway Administration (FHWA) initiated the Falling Weight Deflectometer (FWD) Calibration Center and Operational Improvements Pooled-Fund Study, TPF-5(039) (http://www.pooledfund.org/projectdetails.asp?id=28&status=6). The purpose of this study is to update the FWD calibration system, expedite the calibration procedures, and identify a long-term support mechanism for the FWD calibration centers. Cornell University, which had developed the original SHRP calibration system, was selected to perform the tasks identified in the study. The first two goals have been accomplished, and several useful products as described below have been successfully developed under this study. The most significant outcome of this pooled fund study is the successful development of an improved FWD calibration system. The new system allows calibration to be completed much more quickly, with no loss of precision. In addition, it is compatible with all brands of FWDs sold in the United States. The hardware and software used in calibration have been upgraded to take advantage of improvements in technology. The American Association of State Highway and Transportation Officials (AASHTO) Standard Practice R 32: Calibrating the Load Cell and Deflection Sensors for a Falling Weight Deflectometer has been updated, reviewed, balloted, and published in 2009 as AASHTO R 32-09. The new practice R 32-09 has been implemented at all of the FWD Calibration Centers operated by State transportation departments. In addition, the new practice has also been implemented by three manufacturer-run centers in the United States and Europe. The new procedure has been enthusiastically adopted in several other countries, and several additional countries have expressed an interest in having FWD Calibration Centers use the R 32 protocol. Changes incorporated in the new FWD calibration procedure include: replacing the reference linear variable differential transformer (LVDT) with an accelerometer for deflection sensor calibration; adding a multiple sensor stand to allow calibration of all deflection sensors simultaneously; updating the calibration software to a modern, Windows-based programming language with the ability to read native data formats from each brand of FWD; and using modern data acquisition techniques to eliminate sensitivity problems from the older SHRP FWD calibration protocol. Extensive research was performed to compare the results from the old calibration procedure to the new one in order to ensure no loss of precision. The research established that the new procedure is just as accurate and repeatable as the old one. The time to complete an FWD calibration has been reduced from the previous 6 hours to roughly 2 hours. The number of calibration centers has been doubled, with the objective of reducing the travel time to reach a center to a day's drive or less from anywhere in the United States. The equipment used in the new procedure is highly portable. This allows for the possibility of doing on-site FWD calibration at the FWD owner's choice of location. 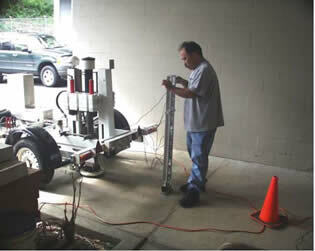 The AASHTO R 32-09 procedure allows for doing so if a certified calibration technician performs the calibration. The feasibility of doing this was demonstrated by the pooled-fund contractor at the Hawaii Department of Transportation (DOT) facilities in Honolulu in December 2008. Since then, several private agencies have done on-site FWD calibrations. A research report, titled FWD Calibration Center and Operational Improvements: Redevelopment of the Calibration Protocol and Equipment (http://www.pooledfund.org/documents/TPF-5_039/FWD_Cal_Report_2009_Mar_8.pdf) was drafted to document the research approach, as well as outline the updates and improvements to the SHRP FWD calibration procedure. The report provides information on how to calibrate a FWD according to the new procedure, explains the basic improvements to the procedure, compares the old versus the new procedure, and provides details about the critical updates. The report also contains the updated protocol for FWD calibration, the drawings and specifications for the hardware needed for FWD calibration, an updated specification for the Pavement Deflection Data Exchange protocol (used to transfer data to and from the FWD), and a flowchart for the new calibration software, WinFWDCal. The final report (when published) will definitely be of interest to engineers and technicians who perform structural evaluation of pavements. To familiarize FWD owners with the new calibration procedure and encourage the State transportation departments and other FWD users to utilize the calibration facilities, a brief 11-minute video Calibrating the Falling Weight Deflectometer was produced. It will soon be available for viewing and downloading at the LTPP Web site, and hard copies in CD format can be obtained at no cost from the LTPP Customer Support Service Center at: ltppinfo@dot.gov or (202) 493-3035. Illustration of the new calibration procedure. Explanation of the preparation that is needed to have a successful calibration. Demand for calibration center services is on the rise. The Nevada Calibration Center has been moved to Colorado, and two additional public centers opened recently in Montana and California. Three of the four FWD manufacturers now have calibration centers, and the fourth one plans to add the capability soon. In August 2001, AASHTO adopted a resolution in support of continued operation of the calibration centers. The importance of the calibration centers to the transportation infrastructure community is clear, especially when FWD-derived inputs are used for rehabilitation design with the Mechanistic-Empirical Pavement Design Guide (MEPDG). One of the main objectives of TPF-5(039) was to identify an entity other than the FHWA to provide FWD calibration services for the long term. The long-term FWD calibration center support needs include annual QA review and certification of the calibration center operator(s), and technical support consisting of training, troubleshooting, equipment replacement, and annual reference load cell calibration. The FHWA reached out to several organizations in this regard, including the AASHTO Materials Reference Laboratory (AMRL), Texas Transportation Institute (TTI), Larson Transportation Institute, and the FWD User Group. Because of AMRL’s national acceptance by State transportation departments, as well as the type of QA services AMRL provides, the FHWA believes that the AMRL is appropriately suited to provide support services to the calibration centers in the future. After several discussions and a hands-on show-and-tell training session at the Pennsylvania DOT Calibration Center, AMRL sent a letter in March 2009 to FHWA expressing their intent to take over the FWD Calibration Center support responsibilities after the pooled fund study ends in 2010. Since then, the FHWA, the Cornell University team, and AMRL have worked together on staff training and related activities aimed at transitioning the FWD Calibration Center support services to AMRL in the summer of 2010. In June 2009, the AASHTO Subcommittee on Materials (SoM) approved the AMRL's plan for taking over the FWD Calibration Center support services. At the 2009 FWD User’s Group Meeting in October, the AMRL Manager, Robert Lutz, made an announcement of the upcoming transition of the Long-term FWD Calibration Center support from the FHWA-led pooled fund study to AASHTO's AMRL. The pooled fund study put a high importance and focused effort in its final task order to assist in the transition by providing necessary documentation and multiple hands-on training sessions for the AMRL personnel. The successful transition marks a major milestone in ensuring the long-term availability of the FWD Calibration Centers to the pavement community. It will go a long way in helping States and other agencies obtain high quality pavement deflection data, which are essential in evaluation of pavement structural capacity and design. For more information, contact Jane Jiang at jane.jiang@dot.gov or (202) 493-3149. LTPP Beyond FY 2009: What Needs to Be Done? This report summarizes the current status of the LTPP program and its major activities, and describes the work that will be needed beyond 2009 to realize the full potential of the world's most comprehensive pavement performance database. A LTPP Data Workshop was organized for the Oklahoma Department of Transportation (ODOT) personnel and university researchers. The objective of the workshop was to familiarize participants with the LTPP database in terms of the contents, structure, and tools available for data extraction and data mining, thereby encouraging the use of this extensive pavement database. The workshop began with an overview of LTPP including LTPP test sections in Oklahoma and the surrounding States. LTPP monitoring activities and frequency were discussed as well as performance data including the specific topics of construction, monitoring (FWD, distress, profile, and friction), traffic, climatic, seasonal monitoring, maintenance, rehabilitation, and materials sampling and testing. An overview of the LTPP Standard Data Release (SDR) was also provided. Key tools, the reference library and table navigator that help navigate and understand the database, were introduced to the participants. Different modules of the data release were reviewed and discussed in detail. Data mining examples were provided and discussed to promote better understanding of the database structure. Workshop attendees also received copies of SDR 23. For more information on hosting a LTPP data workshop in your agency, contact Jack Springer at jack.springer@dot.gov or 202-493-3144. The next release of the LTPP database will be distributed at the TRB 89th Annual Meeting in January 2010. The most significant change in SDR 24 is the addition of the LTPP traffic analysis software (LTAS) database tables. To get your copy of this release, visit the LTPP booth during TRB week. Otherwise, you can request a copy of SDR 24 by contacting the LTPP Customer Support Service Center at ltppinfo@fhwa.dot.gov or (202) 493-3035. If you are in Washington, D.C. for the 2010 TRB Annual Meeting, please make plans to attend the LTPP State Coordinators’ Meeting on January 10 and the LTPP Box Session on January 11. Gary Elkins, Senior Engineer, MACTEC Engineering and Consulting, Inc. The DAWG sponsors this forum to discuss methods of pavement performance data analysis. Briefings will be presented on techniques for extracting, processing, and analyzing pavement performance databases, as well as on preliminary results of applications of these techniques. Pavement researchers, designers, and managers, as well as others interested in the analysis of data describing the development of distresses in pavements, are encouraged to attend. To learn more about the LTPP program and products, visit: www.fhwa.dot.gov/pavement/ltpp/index.cfm or contact the LTPP Customer Support Service Center (CSSC) at: ltppinfo@dot.gov or (202) 493-3035.